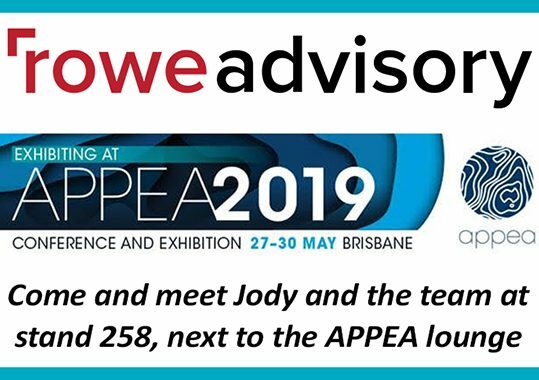 We are excited to announce that Rowe Advisory are exhibiting at the APPEA 2019 Conference and Exhibition this year! APPEA is the largest annual upstream oil and gas event in the southern hemisphere, and is taking place in Brisbane from 27-30 May. This event brings together people from across Australia and around the world, and we are looking forward to the networking opportunities it will bring. The conference theme, “Navigating the Future”, is a perfect fit with our companies vision of developing new ways of working in traditional environments. Flexible, virtual operating models offer companies quick access to key talent and skills, and we are looking forward to showcasing Rowe Advisory’s procurement, human resource, and project management expertise and experience in the oil and gas sector at the event. View our case studies for further information. Come and meet Jody and the team at stand 258, next to the APPEA lounge. Please contact Jody if you are attending and would like to schedule a meeting.